Most discussion of the clash between the federal government and the state – which the San Diego County Board of Supervisors is considering jumping into – has centered on The California Values Act. But the Trump administration is targeting two other policies that deal with worksite inspections and detention facilities. If the San Diego County Board of Supervisors decides to join the Trump administration in challenging California’s so-called sanctuary policies, it’ll be taking on more than the one law that’s gotten the lion’s share of attention. The Trump administration is suing the state over three laws passed by the state Legislature last year that limit cooperation with federal immigration enforcement efforts. The Justice Department argues the laws violate the Constitution’s Supremacy Clause because they are designed to stop the federal government from enforcing its laws. The Board of Supervisors will discuss whether to join the lawsuit on Tuesday. The Orange County Board of Supervisors recently voted to join the lawsuit, while several cities in the county have decided to file legal briefs on the side of the Trump administration. Escondido voted earlier this month to submit a legal brief in support of the federal government. Most discussion of the clash has centered on SB 54 or The California Values Act, which aims to keep local law enforcement officers from participating in immigration enforcement. On Tuesday, the city council in Huntington Beach, California, voted to join the Trump administration lawsuit and prepare its own legal challenge of the state sanctuary law. 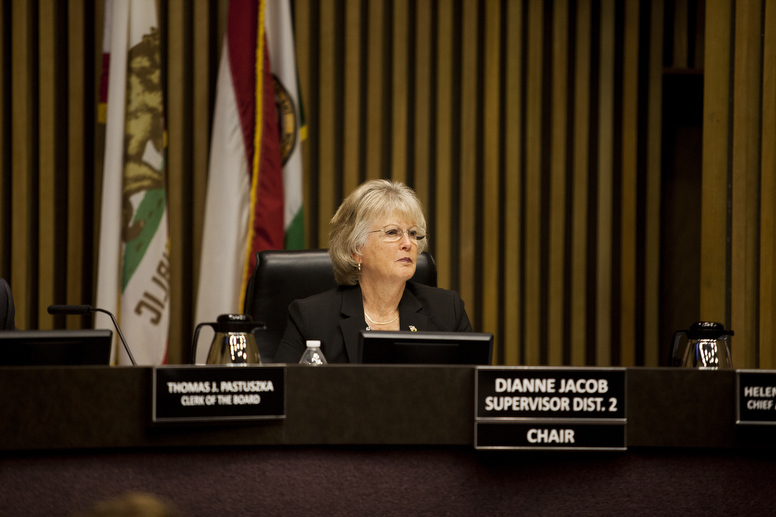 Last month, the Orange County Board of Supervisors also voted to join federal lawsuit. You can read up on what SB 54 means for San Diego, and the problems the head of Border Patrol in San Diego has seen since the law went into effect. But there are two less talked-about laws that are also being targeted by the Trump lawsuit. Both try to provide a buffer against other key parts of the federal government’s ramped-up immigration efforts: worksite audits and immigration detention centers. AB 450 was written by Assemblyman David Chiu, a Democrat from San Francisco, and sets a protocol that private and public employers should follow when federal officials give them notice of an audit or worksite inspection, during which they verify employees are allowed to be working in the United States. Workplace audits have long been common. They are sometimes targeted, and sometimes random. Federal immigration officials check I-9 forms, which employers are required to file for all their employees – citizens and non-citizens – to show they are authorized to work. An employee without the form or whose information on the form doesn’t check out might not be allowed to legally work in the U.S. The audits don’t always result in an unauthorized employee’s arrest, but often fines are levied against companies with paperwork issues. In cases where there seems to be a pattern of an employer knowingly hiring a lot of people without work authorization, charges could even be filed against the employer. California’s new state law requires employers to do several things in the face of these audits and worksite inspections. First, if ICE agents show up to a place of employment, an employer cannot allow federal agents into a nonpublic area without a judicial warrant. Typically, federal officials have administrative subpoenas that don’t require a judge’s sign-off, said Kimberley Robidoux, a senior attorney at Maggio Kattar Nahajzer + Alexander, P.C. who works with companies on immigration issues. The new state law requires an additional step if federal immigration officials want to enter a non-public part of a worksite – seeking a judicial warrant from a judge. For example, the employer can interact with the officials in a lobby, or some sort of public-facing part of the business, but cannot allow them into back offices without the warrant. If officials do have a warrant, the employer can only allow inspection of items outlined in the warrant. Should officials provide a Notice of Inspection, the employer must notify employees within three days. If there is a union in place, a copy of the notice must be provided within three days to the head of the bargaining unit. The law also limits an employer’s ability to re-verify the eligibility of current employees. Employers can only re-verify that eligibility if the employee’s work authorization is set to expire, or to make sure that the form was filled out properly initially, for example. That provision is intended to prevent unnecessary – and potentially discriminatory – reviews of employees’ work authorization in light of the federal government’s crackdown. “This provision is especially timely given Donald Trump’s rollback of the DACA program and the likelihood that many employers may unnecessarily start to audit I-9’s,” Chiu said, before an Assembly vote in September. The Trump administration argues in its lawsuit that the restrictions “have the purpose and effect of interfering with the enforcement of the [federal] prohibition on working without authorization” and says California doesn’t put such requirements on employers for interactions with other federal or state entities. San Diego Sen. Joel Anderson spoke against the bill during the Senate vote in September, arguing it was overly punitive to employers. In a statement for the federal court case, the head of San Diego’s Border Patrol Sector, Rodney Scott, said he was concerned the law would impact federal agencies’ ability to work with local businesses to go after illicit activity. For example, he said, Border Patrol often works with business owners in Otay Mesa to find and monitor clandestine tunnels used to smuggle drugs, where officers often have to access non-public areas. But Robidoux said she doesn’t think AB 450 would interfere with that type of interaction between federal officials and business owners, since it’s focused on employee records and worksite inspections specific to the I-9 work authorization forms. A public safety trailer to California’s budget bill, AB 103, gave the state attorney general the power to monitor immigration facilities, both public and private, located in California, and appropriated $1 million over the next 10 years for state oversight of detention facility conditions. According to the federal lawsuit, state Attorney General Xavier Becerra sent letters requesting to inspect various ICE detention facilities in November 2017. Five of those facilities have been inspected since the law’s passage. In January, Becerra sent letters requesting to inspect several other facilities, including Otay Mesa. The federal lawsuit argues that where immigrants are detained is a “law-enforcement decision” that California is improperly interfering with; it also complains that California isn’t placing such restrictions on any other local or federal agency and is targeting immigration enforcement. “The statute thus commands an improper, significant intrusion into federal enforcement of the immigration laws,” reads the complaint.